Defined Intramural 2.0: Friday Night Lights! DEFINED INTRAMURAL 2.0– the Friday Night Lights edition! Back by popular demand (and so Team Gold can redeem themselves), Defined is bringing back our weekly in-house throw-downs—and along with them, a sprinkle of some healthy gym-wide competition. WHAT is DEFINED INTRAMURAL 2.0? As a gym, we complete the 5 CrossFit Open workouts together in teams of 20+. The CrossFit Open is a 5-week online competition that is open to everyone; last year over 400,000 athletes registered from over 175 different countries. This in-house program is independent of the CrossFit Open, and you do not need to register for the CrossFit Open to participate with us! Defined Intramural 2.0 is open to EVERYONE: all levels, abilities, and experiences! Defined’s goal is to educate and inspire! Competition helps with the ‘inspire’ part; the pressure to perform pushes you to train harder; the social boost of dozens of your best friends and fellow gym-mates cheering for you will help you reach a greater expression of performance. Most importantly, we focus on inclusion and celebration. The Defined Intramural Open is meant to be a memorable experience during which you’ll support and be supported. Once everyone has registered (DEADLINE: Wednesday, February 13th at 5pm to ensure a team jersey), we’ll divide the gym into 5 random teams. Team scoring will be based on multiple factors; performance alone will not decide who wins and loses. You may do the workouts outside of the Friday Night Lights throw-down and still score points for your team; HOWEVER, the goal is for everyone to come together on Friday for an open throw-down from 7:00pm to 9:00pm (while repping your team uniform and/or color). You do not need to be at each Friday throw-down to participate. You can also miss a workout; it’s a cumulative effort from the team that matters. 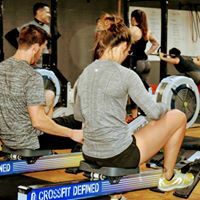 Every Friday night from 7:00pm-9:00pm we’ll run heats for each workout, along with judges to count and score reps. Spectators are welcome and encouraged to watch and cheer on participants. Bring a friend, a beverage, and some snacks—and we’ll end the week on a high note! The first Friday Night Throwdown will be on Feb. 22nd with the last and final throwdown taking place on March 22nd. BLUE >> Captain: Cara – Co-captains: Danny, Ben R.
$25 - includes a team uniform. 4pts – Throw-down participation: show up for Friday Night Lights! 10pts/8pts/6pts – Top 3 male/female athletes in RX and Scaled Division. Scoring is based on gym scores (not the CrossFit Open Leaderboard scores). QUESTIONS? Email Coach Kevin at S2V2aW4gfCBjcm9zc2ZpdGRlZmluZWQgISBjb20=. We can’t wait to see you there! First Throwdown - Feb. 22nd!